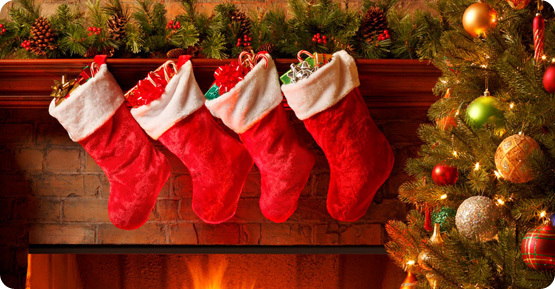 Some of the hardest gifts to buy are stocking stuffers, secret Santa party gifts and gifts for office co-workers. Even though you see your co-workers every day, you might not be sure what they want. You do want to put a smile on their face and give them something they'll enjoy. We put together this list of extremely popular pen related items based on sales this year. The list is organized by price range - under $10, $10 to $20, $20 to $50, $50 to $100 and $100 up to make it easy for you to stay within your budget. Sheaffer calligraphy set with 3 nibs....$5.99 Perfect for writing notes, holiday cards, or just practicing lettering. Three different nib sizes give you a variety of italic lettering styles. 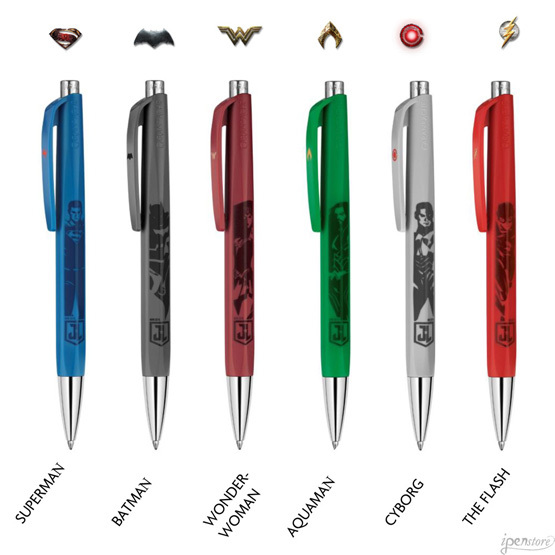 Caran d'Ache Infinite series pens with licensed DC Comics Justice League super heroes. $7.99 each. Sticky page markers by Duncan Shotton are fun for any reader. Choose Tokyo (with godzilla), New York City (with King Kong), Nessie (Loch Ness monster), Mars, or any of a dozen different designs for $5.97 a pack. Pocket notebooks are a great low-cost gift idea for anyone who is a note-taker, list-maker or doodler. We carry a variety of pocket notebooks with plain, graph ruled, dot grid or lined pages. Rosetta Notes are made in Michigan with fountain pen friendly paper and are priced at $8.97 for a 3-pack. Star Wars by Sheaffer - Journals, Pen pouches, Rollerball pens and Fountain pens in Darth Vader, Yoda and R2-D2 designs. 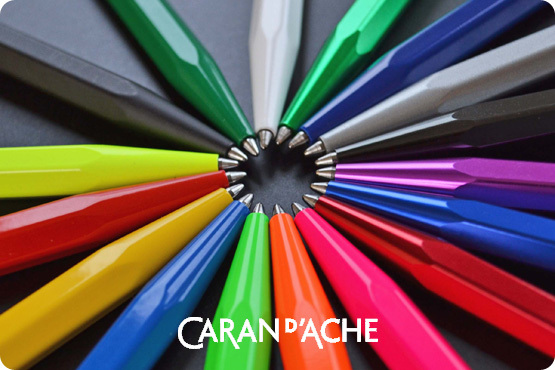 Metal Collection pens by Caran d'Ache. Everyone will appreciate the writing quality of these pens from Switzerland. A wide variety of colors are available. We pack each pen in a Caran d'Ache cardboard sleeve for easy gift wrapping. $19.97 for ballpoint pen or 0.7 mm mechanical pencil. Also available in a matching fountain pen for $51.97. Pilot Metropolitan fountain pens are our most popular starter fountain pen. And now they're available in three nib sizes - Fine, Medium and Stub for calligraphy. Priced at $14.97 in an assortment of colors. Worther Shorty sketch pencils. The Shorty gets its name from its 4-1/4" length - short compared to a standard writing instrument, but long enough to comfortably fit in your hand. The rugged plastic barrel has a hexagon shape, and is 1/2" in diameter. The shape of the Shorty provides excellent grip and comfort, and the size and light weight is just right to eliminate hand fatigue. The lead is easily advanced or retracted with the push button spring clutch mechanism. Only $12.97 each. Fisher Space Pens have been an extremely popular gift item since the 1960s. Fisher pens are known for their vibrant colors, innovative designs, and the famous Fisher pressurized ink refill. The Fisher refill, designed for use by NASA astronauts, will write in extreme temperatures, under water and even upside down! Fountain pen ink in over 600 colors! Shown above is our newest series of fountain pen inks from Rohrer & Klingner of Germany, called sketchINK. It can be used with a fountain pen, brush, or dip pen and produces vivid colors. We have ink samples of every fountain pen ink we stock, so you can see the shading of all of our inks before you buy. Do you have a resident nerd or geek in your office? Here's the perfect pen - a four-function Rosetta Quattro pen for $17.99. It has 3 ballpoint tips (black, blue and red) and a 0.5mm pencil tip. We buy these in bulk to save on packaging, but put a request in with your order and we'll include a gift box. Want to make a big impression? Buy someone a Ferrari! With the Ferrari licensed pens from Sheaffer, you can buy a Ferrari without breaking the bank. Prices start at $19.97. The Conklin Minigraph brings big performance in a mini package. At 3.9" when capped, the Minigraph is small enough to fit discreetly in a front pocket or small bag compartment. When posted, the pen is 4.85", giving is a full size feel for an effortless grip and perfect balance. Turned from solid bars of acrylic resin and adorned with bright chrome accents. Only $39.97 for the fountain pen (in fine, medium or stub nibs), or $35.97 for the ballpoint pen. Give the gift of organization with the Rhodia Goalbook! The Goalbook features 120 high grade Clairefontaine brushed vellum sheets (240 pages). This notebook works great as a planner or a bullet journal. The 240 pages include 224 numbered dot grid pages, 6 pages for a table of contents, an undated annual calendar, and and undated monthly calendar. $24.97 each. The Rhodia Goalbook just might be the ultimate journal planning tool. Safari by Lamy is one of the best selling fountain pens in the world. It is at the top of the list of "best every-day fountain pens" by our entire staff. The Lamy Safari is fun and functional. The unique design features a flexible brass wire clip and comfort molded grip section. 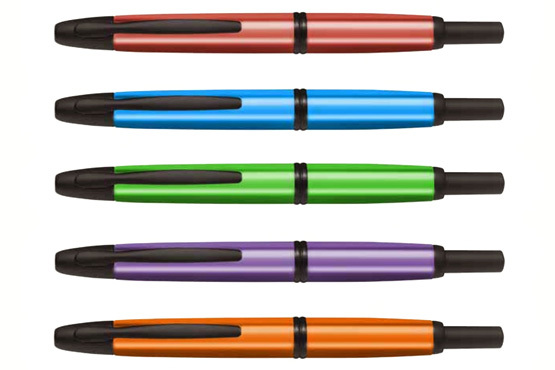 The Safari comes in a range of colors, and the fountain pen is available for only $29.60 each. Tool pens by Monteverde come in a wide variety of colors and functions - ballpoint, pencil, rollerball and fountain pen. Tool pens are one of our biggest "last minute" gift pens. Prices start at $24.97. Our Paws pens have been a top seller for the past two years. Choose from the antique pewter dog paws pen (with customer dog bone clip), or the antique copper finish cat paws pen with a custom cat clip. With the purchase of every Paws pen, a donation is made to The Humane Society. The Rosetta Magellan's design is inspired by classic pens of the 1920's and 1930's. The lustrous finish is crafted from Italian acrylic resins, and is available in 8 finishes. Equipped with a German-made JoWo #6 two-tone stainless steel nib for precise ink flow (available in your choice of Extra Fine, Fine, Medium, Broad, 1.1 mm or 1.5 mm Stub Italic points). $69.97 for the fountain pen. Cross Botanica is styled with a rich, pearlescent ivory finish beneath a beautiful floral design. The series is inspired by the beautiful floral patterns used in henna designs. Botanica is available in a ballpoint, fountain pen or rollerball pen in a choice of three finishes. Prices start at $75.97. Aston leather pen cases are one of the best gifts if you have a pen lover, but don't know what their pen preference is. Prices start at $11.97 for a single pen slip and run to $100 for a 40 pen collector's case. All leathers are the finest top grain leathers and finished in New York City. Pilot Vanishing Point fountain pens have a cleverly designed hood that covers the nib as it retracts, preventing drying or leaking. The nibs are solid 18k gold and are available in a variety of nib sizes. Prices start at $147.97 for the standard size Vanishing Point and $139.97 for the smaller version called Decimo. Visconti looked for inspiration from one of the world's greatest artists, Rembrandt van Rijn. His painting technique, chiaroscuro, is echoed in the Rembrandt finishes. On close inspection, apparently solid colors reveal the chiaroscuro nuances, giving the illusion that each one is painted by hand. The Parker Sonnet is a timeless, elegant design. Each Sonnet is hand assembled and checked for flawless quality and precision writing. Available in a wide range of finishes, the Sonnet is a work of beauty, emblematic of Parker craftsmanship. The Duofold has been an emblem of Parker's heritage and a symbol of excellence since 1921. 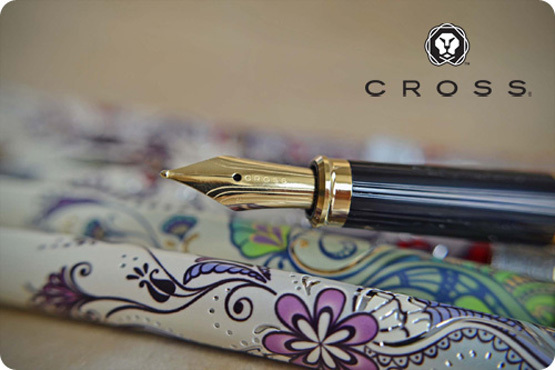 The Duofold offers an exceptional comfortable and luxurious writing experience. Each pen is brought together by hand to ensure the finest writing experience. The 18-carat gold nib is exquisitely emblazed with an iconic ace design and classic Goldsmith Hallmarks.